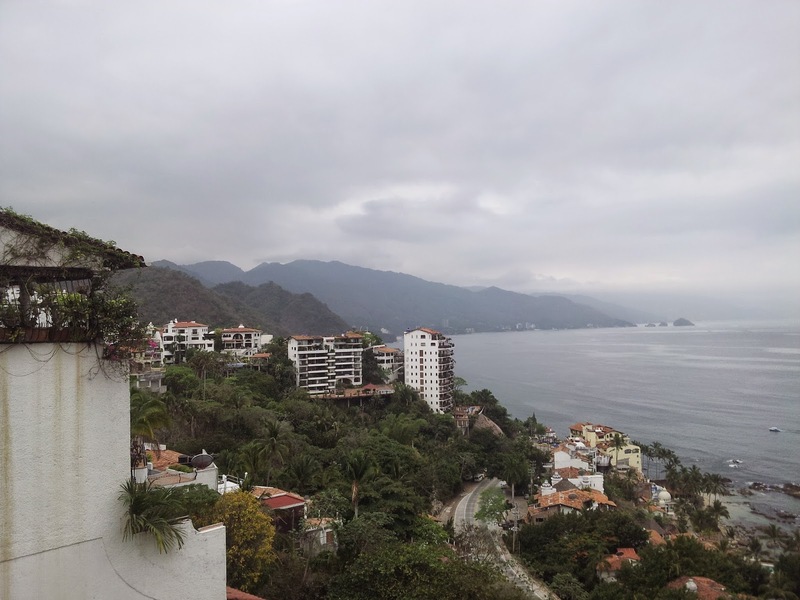 As my plane glides into its final descent along Puerto Vallarta’s coast, miles of dense jungle, gleaming ocean and lush golf courses etched out along the sea cushion the memories as they come flooding back to me. Thoughts of long ago vacations with my then husband and our young daughters fill my head. 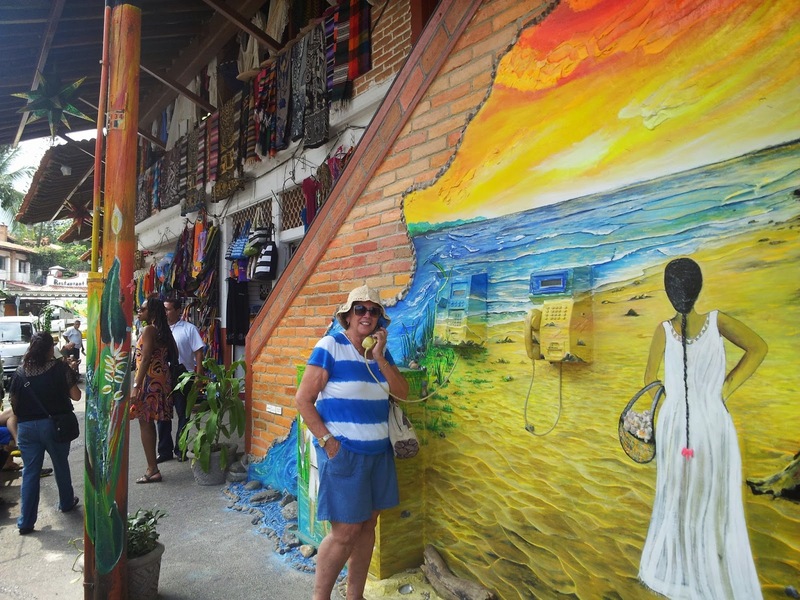 Fond memories mingled with angst cloud my mind as I return to this slice of paradise on the Pacific coast of Mexico. The flight attendant’s final announcements jar me from my reverie. It’s back to reality and time to face that proverbial "road not taken." Amid the intrusive pre-landing instructions and the inevitable commotion of preparing for our landing, I feel a tug at my heartstrings as I spy the secluded Playas Gemelas where we once frolicked. It doesn’t seem that ago that we danced among the waves on those twin shores, yet I delude myself. Life has moved on for all of us in the 30 years since we first left our footprints in this sand. The memories are amazingly fresh and I feel vulnerable, yet as the door of the plane opens the familiar flower scented air embraces me like a long lost friend. It was with some trepidation that I journeyed here but a good friend convinced me that a visit to Mexico is always good for the soul. 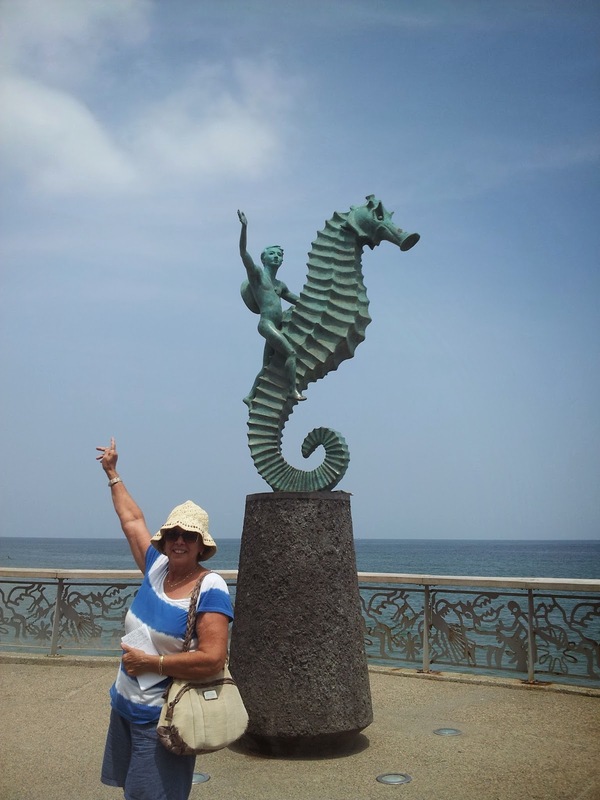 There is a magic to Puerto Vallarta, which defies explanation. You must simply spend some time there, soak up its unique atmosphere and live it. Whether it was this mystique that fueled the fiery attraction between Liz Taylor and Richard Burton when he was filming “The Night of the Iguana” here in 1963, and what prompted director John Huston to claim it as home until his final years, is hard to say. Their torrid affair and the onslaught of paparazzi that came with it, carved this scenic haven onto the international map forever, drawing Hollywood types and savvy sybarites ever since. 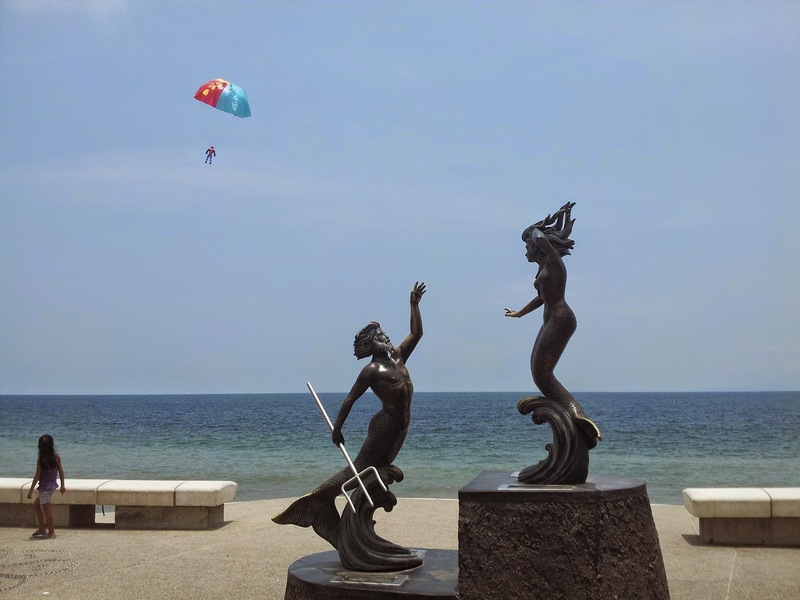 Long before the adulterous duo made Puerto Vallarta their favorite trysting place, the Bahia de Banderas (Bay of Flags) was a refuge for ships seeking shelter from Pacific storms and marauding pirates preying on Spanish galleons. Nowadays, this sultry area straddling the bay in the State of Jalisco has a cachet all of its own. 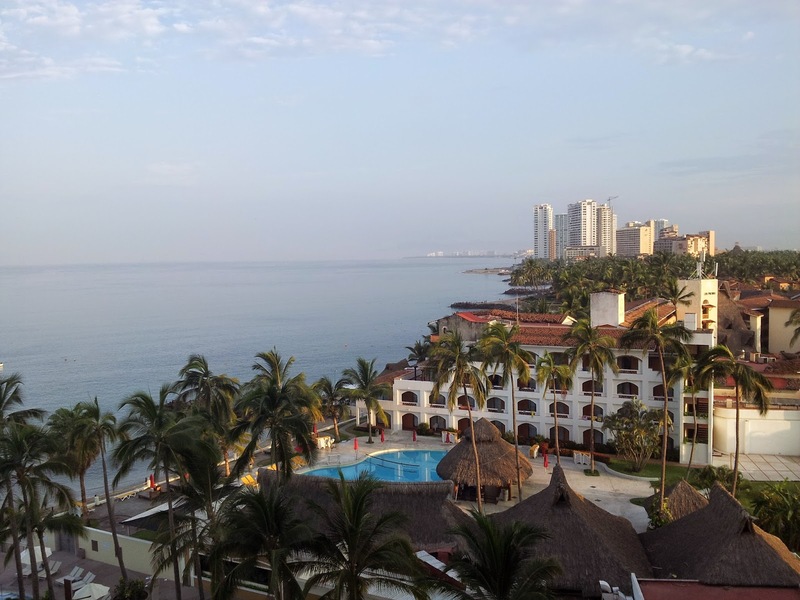 And unlike other beach resorts in Mexico – downtown Vallarta as it is know to locals (PV to English speakers) – has managed to escape the inevitable “gringo-ization” of other resorts in Mexico and has retained the unmistakable flavor of “old” Mexico…the real Mexico. A short taxi ride into town lands me in the center of this colonial gem by the sea. I’ve chosen the Hacienda San Angel to be my home away from home for my trip down memory lane. An enclave of five Mexican villas, one of which was given by Richard Burton to his then wife Susan as a Valentine’s Day gift, its colonial tiles, fine woodwork and rich antiques, lend credence to the Mexican adage, “mi casa es su casa,” (my home is your home). Hidden gardens and stunning views of the Bay and the landmark crown atop PV’s Basilica are exceptional perks. Its location, just steps from downtown affords easy access to local activities. Around the corner, Casa Kimberley - given by Burton to Taylor long ago - sits in silent tribute to another shattered marriage. Burton subsequently purchased the house across the street and a bridge links the two to this day. 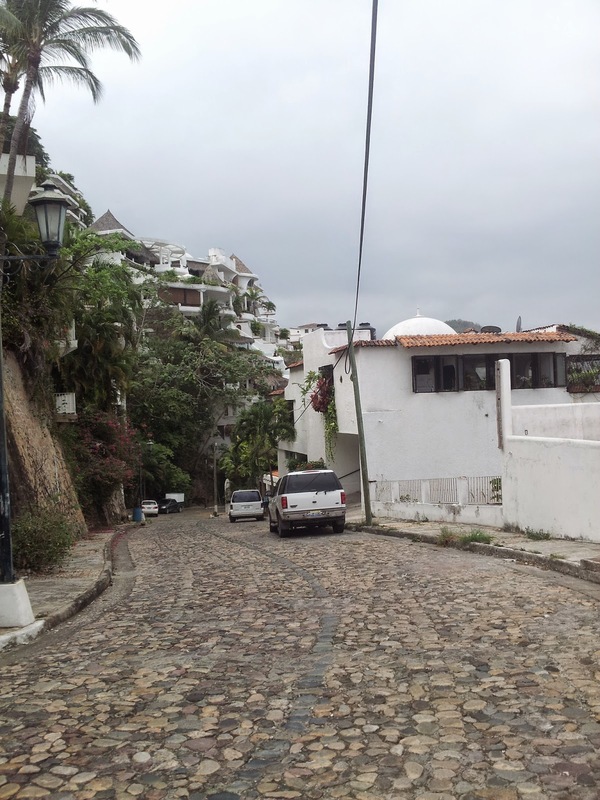 The original downtown area – the heart of PV - with its small white-washed adobe buildings, red-tiled roofs and steep cobblestone streets - unfurls from the lush Sierra Madres, spilling onto the seafront, making it easy to explore on foot. 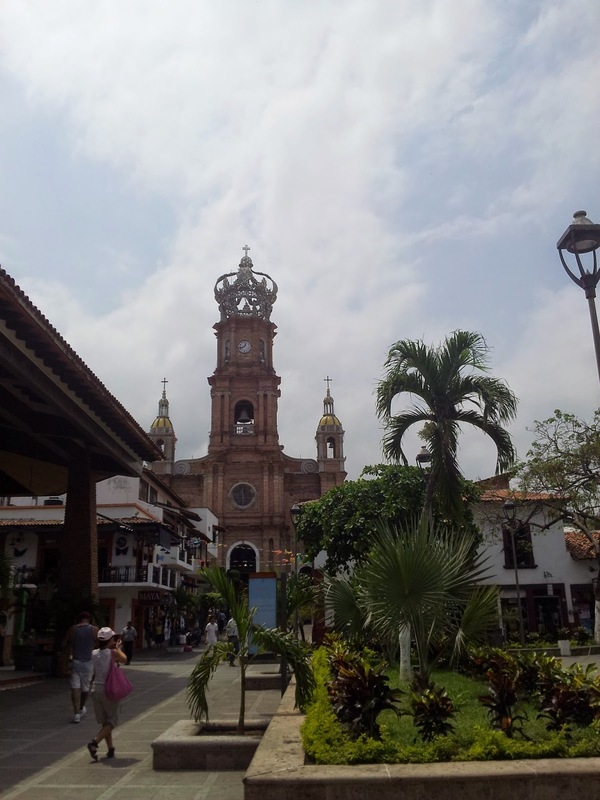 La Iglesia de Nuestra Senora de Guadalupe - the heart of Puerto Vallarta religious life - is the focal point of an elaborate 12-day festival each December. Construction was carried out over a 12-year period beginning in 1929 and the ornate crown had to be replaced after it was damaged in a 1995 earthquake. 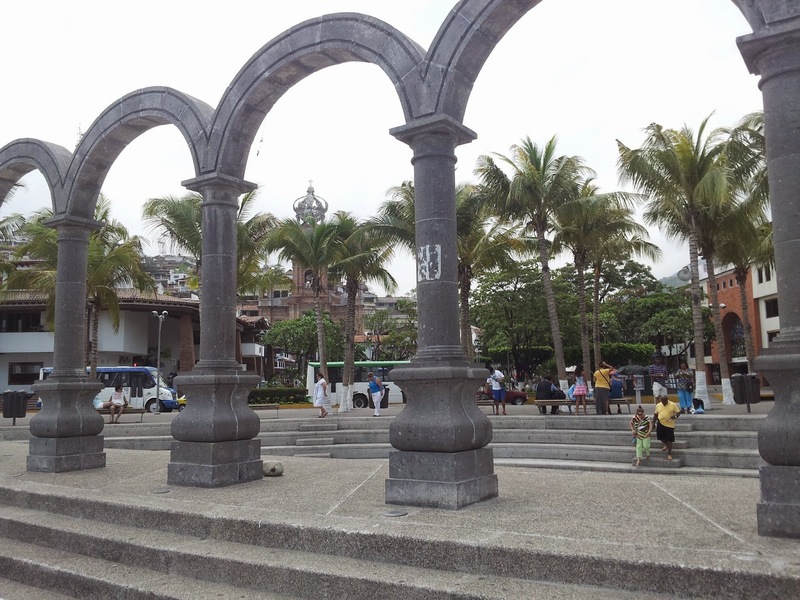 On Sunday nights the small main square comes to life when the concert band strikes up in the ornate gazebo and everyone dances in the park and snacks on elote - grilled ears of corn slathered with mayo and sprinkled with chile powder. 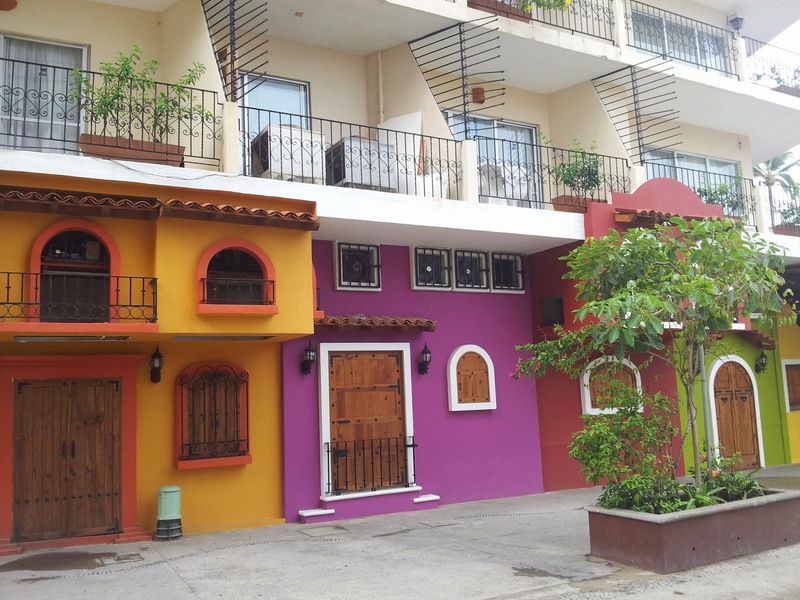 There are two distinct neighborhoods downtown: Viejo Vallarta (Old Town Vallarta) and the Zona Romantica, (Romantic Zone) also known as Playa los Muertos (Beach of the Dead, named after an alleged bloody battle between pirates and local Indians, centuries ago. The seafront promenade - known as the malecón - is the focal point of local life here. Whimsical sculptures by local artists line the 11-block strip of boutiques, cafes and cozy bistros which provide activity all day and late into the night. At its southern end, a series of lighted arches act as the stage for live music or performances by jugglers, dancers, comedians and art exhibits. 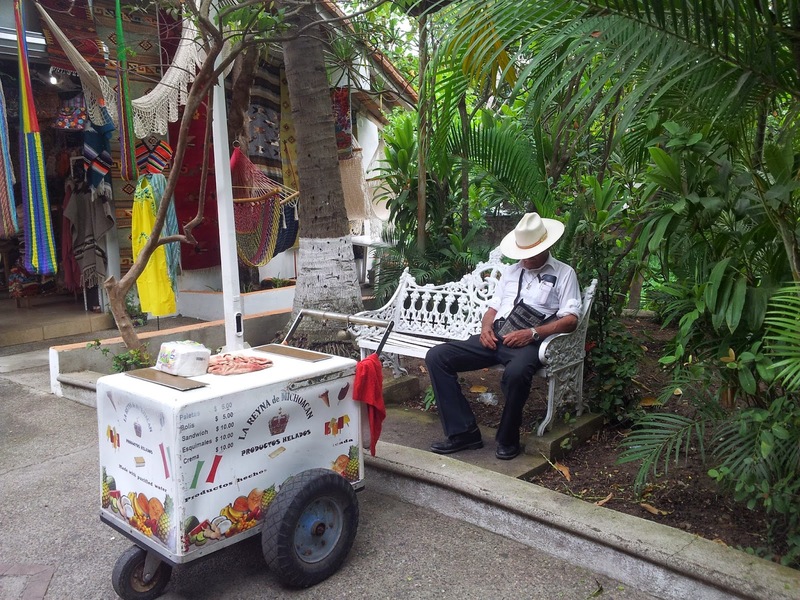 Culturally and gastronomically speaking, PV ranks second to Mexico City. Each year, in November, the International Gourmet Festival draws award-winning local chefs and more than 20 guest chefs from around the world, to showcase their skills at venues around town. Throughout the year there are cooking classes, wine, tequila and beer tasting events and an annual film festival. 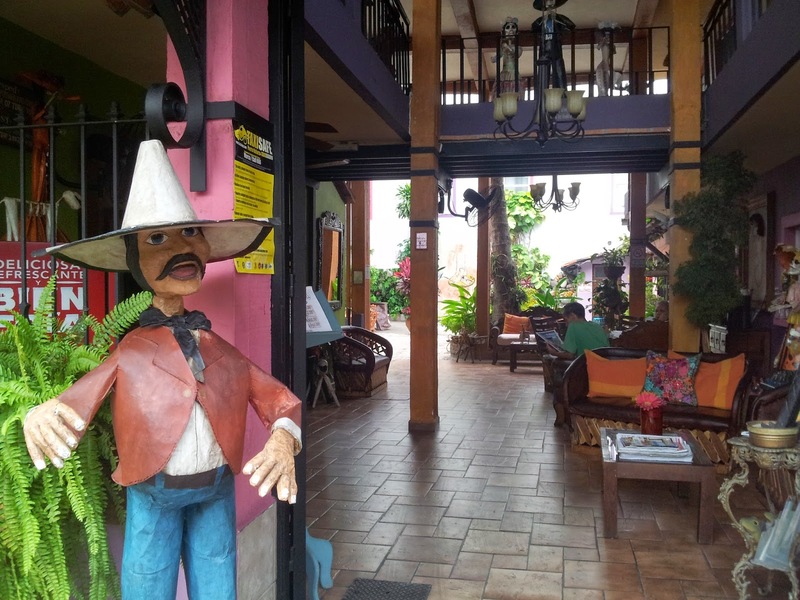 Some of Mexico’s top chefs along with numerous chefs from around the world have settled in Puerto Vallarta and opened restaurants here. El Arrayán is no one of the most popular restaurants. Tucked into an old house, the food is traditional Mexican, and the "Margarita El Arrayán," legendary. Owner Carmen Porras is hospitable and very proud of her establishment. During the low season, she offers cooking classes, which include a visit to the local market with the chef to purchase the ingredients. I notice with some sadness, that one of our favorites - Pietro's - is closed and our favorite ice cream parlor - Bing's - is now a shoe shop. So much has changed since we visited as a family long ago. Those little girls I raised on those sun-kissed shores have grown into successful young women and one of them has made me a grandmother.